Boonslick Chordbusters - 2018-02-12 - Chorus news item: "Established Quartet Seeking 2 Tenors and a Bass"
"Established Quartet Seeking 2 Tenors and a Bass"
There's a youth quartet contest coming up, with a cash prize even! Want to form a youth quartet for the contest, but don't know three other interested singers? 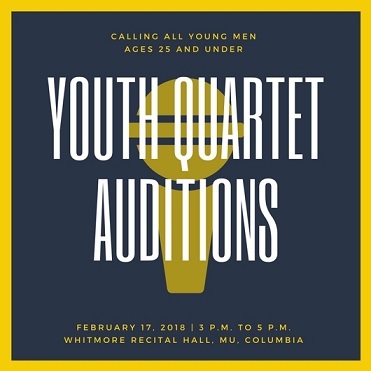 Come to the quartet audition Saturday, February 17th and be matched with similar voices to form your new quartet. Check out the link below for details!